ABC dominated the drama wins at the AACTA Awards Ceremony with three for Mystery Road and another three for Riot. Also recognised were Australian Survivor, The Weekly with Charlie Pickering, Selling Houses Australia and Hannah Gadsby: Nanette. 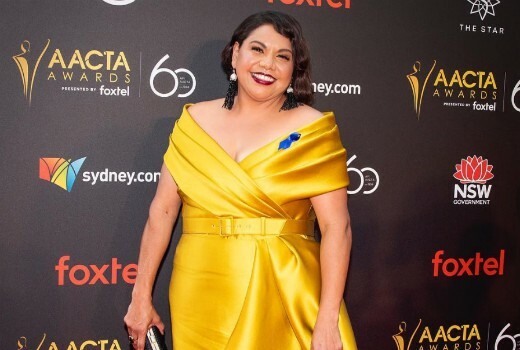 Winners have been announced in the 2018 AACTA Awards this evening in Sydney hosted by Stephen Curry. Bryan Brown accepted the AACTA Longford Lyell Award, Australia’s highest screen accolade. The Award was presented to Brown by Simon Baker, with touching tributes from Warwick Thornton, Sam Neill, Sigourney Weaver, Tom Cruise, Baz Luhrmann, Ben Mendelsohn and Rose Byrne, among others. Sweet Country won for Best Picture also from Mystery Road producers, Bunya Productions. The Byron Kennedy Award, which celebrates outstanding creative enterprise within the screen industry, was presented to award-winning filmmaker, photographer and philanthropist Ian Darling AO (Paul Kelly: Stories of Me, Alone Across Australia, In the Company of Actors, The Oasis). TV Tonight is a partner of the 2018 AACTA Awards. The show itself was so refreshing. I prefer the theatre-style seating, instead of watching people get drunk, chat, look at phones and generally ignore the presenters. Also, Aussies don’t take themselves so seriously (except when it is genuinely deserved) and you could tell people were enjoying themselves. Only gripe was that Nicole Kidman was a bit too prominent. Sitting her directly behind Bryan Brown was a mistake. Oh, and neglecting to even mention Bryan Brown’s best work on A Town Like Alice was sad – it is not easy to act being crucified. I had no idea that Australian television comedy was in such a poor state. Perhaps AACTA thought that ‘Mad As Hell’ was actually current affairs. Am happy that Mystery Road and Riot won a few awards last night. Very deserving, as both were great watching. Glad Selling Houses won best Lifedtyle too. (Am happy with a few of the film wins too) . Loved The Letdown from its first outing…Congrats…. Also Kudos to those involved in Employable Me…a well deserved win…. Thank you for reporting David Knox. I really try to keep my comments positive, but Stephen Curry’s hosting is absolutely cringeworthy !